There is something so unmistakably peaceful and wholesome about simple country living. This is what makes the rustic scrap quilt patterns in At Home with Country Quilts: 13 Patchwork Patterns a perfect marriage between easy quilt patterns and timeless, homey designs.Quilters who enjoy creating quilts for casual living will adore this collection of comfortable scrappy quilt patterns featuring primitive country styles in a variety of sizes, designs, and earthy color combinations. Find everything from lap quilts with charming applique details to welcoming nine patch wall quilts, as well as many more simple patchwork patterns that are meant for relaxing and enjoyable quilting. While many quilting books flaunt stylish embroidery and expensive charm pack patterns, At Home with Country Quilts stands out amongst other quilt books because it champions the warm and provincial vibe of scrappy country-style quilts. 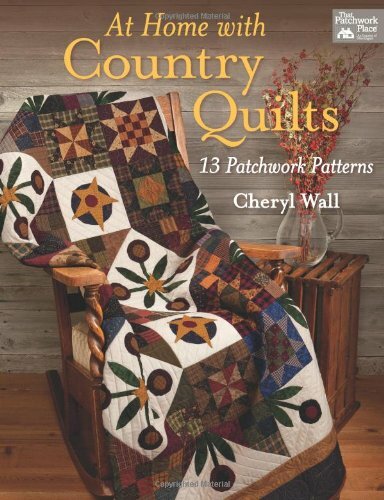 Author Cheryl Wall's selection of easy quilt patterns have a casual feel, yet all 13 patchwork quilt designs are tasteful home decor patterns that reflect the coziness and simple living of the country. As soon as I opened to the first quilt pattern, I instantly felt like I was embarking on a journey through a rural American landscape. Each of these scrappy primitive quilt patterns is characterized by calming color palettes inspired by the earth, sky, and agriculture. Nine patch patterns influenced by the brown and gold of autumn leaves and flower garden quilt patterns that reflect spring's first bloom are just a few examples of the way Wall's quilts draw from the beauty of the countryside. Some of the most enchanting names of these primitive quilts include: Starry Night in Winter (p.69), Sunflower Explosion (p. 74) , and Shoofly Pie (p. 56). Readers will also find that every pattern comes with a small introduction, a simple materials list, clearly written instructions for precise cutting, and a helpful illustration for every step of the quilting process. Whether you are a seasoned quilter or a beginner, you will have no problem understanding these traditional piecing methods as well as the simple quilting techniques for wool applique and cotton fabric. Making the patterns within At Home with Country Quilts is a pleasant way to add a heartwarming countryside design to your home. Get ready to grab your basket of scrap fabric and enjoy the time you spend making these lovely pastoral patchwork quilt patterns. Gifted by Martindale???? Where's the download??????????? I love the look of these quilts. So cozy and homey!